We recently received exciting news from Daniels FirstHome about their new free workshops for homebuyers, and now we have another big announcement from The Daniels Corporation - the highly anticipated Parc Towns development in Mississauga will open in April! Parc Towns is part of the ambitious and successful Daniels Erin Mills master plan at Eglinton Ave. West and Erin Mills Pkwy. You’ll get your opportunity to purchase a new townhome at Parc Towns next month, but keep in mind that there are only 19 available, so you’ll have to act quickly as soon as you receive a notification from Daniels. Every unit is a three-storey model with three bedrooms, and prices will start from the upper $700,000s. This is an incredible opportunity for move-up buyers looking to raise children in a friendly, vibrant community. 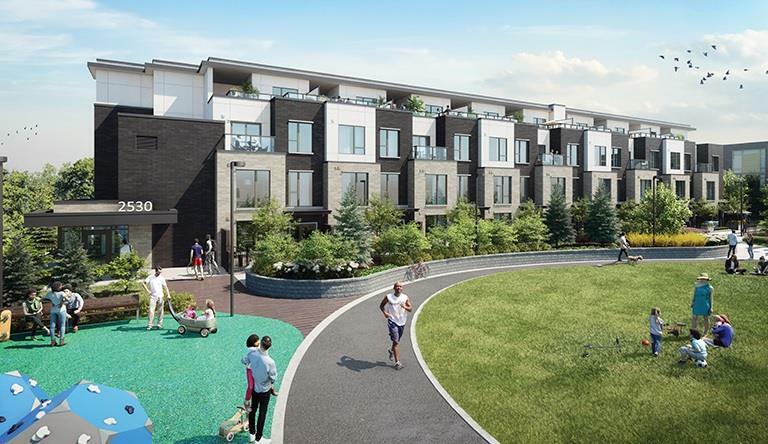 Parc Towns is on the south side of a beautifully landscaped courtyard, which is shared with other Daniels Erin Mills developments, including Arc Condominiums, the Skyrise rental residence, and West Tower Condominiums. There is also a playground steps from Parc Towns, near West Tower. Between all four buildings, there is a wide variety of floor plans, so the community is made up of owners, tenants, singles, couples, empty nesters, and growing families. This type of tight-knit community is rare when shopping for new home construction, which is why we’re pretty sure that Parc Towns is going to sell quickly. And like most Daniels communities, Parc Towns is already well under construction, so you won’t have to wait years before moving in! We did not receive an estimated move-in date, but the fact that construction is already underway means you have the confidence that this project is happening and you’ll be moving in sooner rather than later! This is your final opportunity to purchase in the Daniels Erin Mills community, so you should definitely register right now! Parc Towns will be opening in April, and like we mentioned above, we feel like these 19 townhomes will likely sell quickly. Springtime is a busy season for buyers - the weather is getting better and people are inspired to start something new, and what’s more exciting than buying a new home? For more information about Parc Towns, you can also call 905-306-6996.